Sardines here in the Philippines are definitely a common household dish synonymous with every day. Sardines are known as a food fish that primarily cater to human nutrition, and also serve a variety of purposes in the underwater ecosystem. Sardine oil can also be used as an ingredient in paint and varnish. These fish are also known as Pilchard as an alternative name. Sardines are tiny fish with a radiating silvery exterior and are about 6 to 12 inches in length. They are a species of fish that gather in tightly knit schools and are known to consume great quantities of plankton or zooplankton/animal plankton. Sardines as animal species are part of the Clupeidae herring family of fish. Their etymology originates from the Italian island of Sardinia. These are lower tier fish of the aquatic food chain, commonly abundant in both the Atlantic and Pacific oceans, as well as most parts of the Mediterranean Sea. This explains why France, Norway, Portugal, and Spain are the most prominent distributors of canned sardines all over the globe. Sardines are a universally enjoyed dish of absolute delight relative to each culture across the world. There are generally five types of Genus of sardines: Dussumieria, Escualosa, Sardinella, and Sardinops. European nations were the first major forces to seize and mass produces sardines and their fishing process. With the many uses for sardines, the sardine industry and as well as the preceding fisheries are a booming figure in cross-continental economics. Sardines have even been ingrained in popular culture by being adopted as a colloquial saying that refers to situations of being crowded. Sardines in the Philippines as well as all over the world are commercially caught (usually during night time) and gathered with an encircling net of different varieties. They are then dipped and immersed in brine immediately after capture. Packaging and preservation methods for distribution vary from country to country. 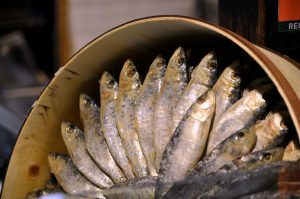 The history of sardines as a food dates back to the time of Napoleon Bonaparte, who played a major role in popularizing the canning process for these tiny creatures. Napoleon implemented the distribution of these canned fish as the staple food for all the citizens across the French territory. Sardines are currently receiving a tremendous amount of attention due to the widespread appreciation for their nutritional and health benefits for human beings across all ages. Canned sardines are typically drowned in olive oil when stored. However, there are many canned sardines that are also packed in water and have fewer macronutrient counts of fat. Each can of sardines carries their own individual expiration date depending on production style. Fresh sardines straight from food markets are ideal when they are rich in firmness, have a shiny coating, and have bright eyes. There’s a plentitude of established health benefits that promote stronger heart functions and bone structures. These are made possible through their richness in vitamin D and vitamin B12. The content sources of omega-3 fatty acids are optimal mitigating nutrients for more stable cholesterol levels and cardiovascular health. Sardines are known to carry high amounts of protein and essential amino acids that improve muscle tissues, fibers, and antibodies that build healthier and improved immune systems. If planned to be stored in a kitchen, sardines should ideally be kept in a cupboard –cool in the realm of room temperature and not subject to immense heat. Opened and unconsumed sardines should be kept inside the refrigerator. Sardines are an incredibly popular and go-to dish because of the fact that it takes incredibly minimal means when it comes to preparing and serving. Although sardines are typically on-the-go, canned sardines are typically rinsed in a quick manner to remove excess oil before eating, while fresh sardines are gutted and heavily run through cold water. 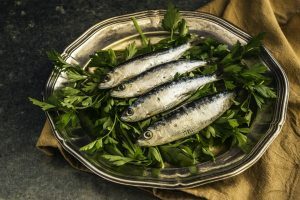 A few great ingredients that are widely used in the preparation of sardines include: lemon juice with extra olive oil, mixtures with onions and olives, tomatoes with oregano or rosemary, soaks in balsamic vinegar. In many preferential cases, cooked sardines are also served with garlic, Dijon mustard, salt, and pepper. Although it is evident and clear that sardines are a universally loved and enjoyed food of utter convenience, it’s important to also make sure that allergic tendencies are first made sure to be in the clear despite the common utility of sardines as a food, they can also trigger allergies in certain people and their specific cases. When in the supermarket, a good indicator for quality sardines is if the fish’s head and gills are taken out prior to packaging. The most common factor when it comes to canned sardines is the utmost convenience of the packaging upon consumption. Canned sardines are typically in the same form of a beverage or soda can with a tab that is easily pulled off along with the surface lid. Sardines in the Philippines is a dish that is widely consumed across each household regardless of class. There are many distinct and unique ways to prepare and serve sardines with each country carrying their own variations in recipes. In Canada, the home of The Brunswick brand (founded sometime during the 1880s in Blacks Harbour by the Connors Brothers) is known and established as the world’s largest sardine production company. England has a reputation for having a rich history with sardines, especially in the Cornwall area of the United Kingdom. ‘Cornish Sardines’ have become a national pride of England with rich traditions and the pilchard dish known as the ‘stargazy pie’. Around the coasts of Croatia, sardine fishing can be traced back to thousands of years ago in the Dalmatia and Istria areas. And in this day and age, Croatian industries still continue to thrive from the local fishing waters. In France, the tradition of préparées à l’ancienne, where sardines are fried prior to being canned has been adopted across the world. To take it even further, the process of sardine canning itself is traced back to have originated in France. In India, contrary to most of the commercial world, canned sardines are not a common means of consumption for the locals at all. Sardines are always eaten fresh, and for the Keralites and other peoples of India, deep-fried sardines are of the most favorite of delicacies. In both northern and southern regions of Italy, sardines are known as the Sicilian national dish and utilized as an ingredient in most of the distinct local flavorful recipes. The Japanese have also found creatively distinct ways of implementing and serving sardines in their native recipes. Dried and plastic packaged sardines are known as ‘niboshi’, young sardines are sometimes used as toppings on rice, there’s also a dish with garlic, soy sauce, and oil saldina known as wakame, and finally, the Japanese are also fond of with simply serving fresh sardines together with a lemon. Morocco is the head lead in supplying canned sardines in Europe, and as a nation, is known to be the largest scale sardine exporter in the planet. Some of their world-renowned local delicacies include: sardines that are fried stuffed and sardine balls simmered in a spicy tomato sauce. Although Norway no longer has sardine canning as one of their main cultural activities, there stands a sardine museum in Stavanger city as a tribute to the past refineries. Peru has quite the extensive history and heritage when it comes to the human consumption of sardines and extraction of fish oil. Dating back to the ancient Peruvian civilizations of the Americas. 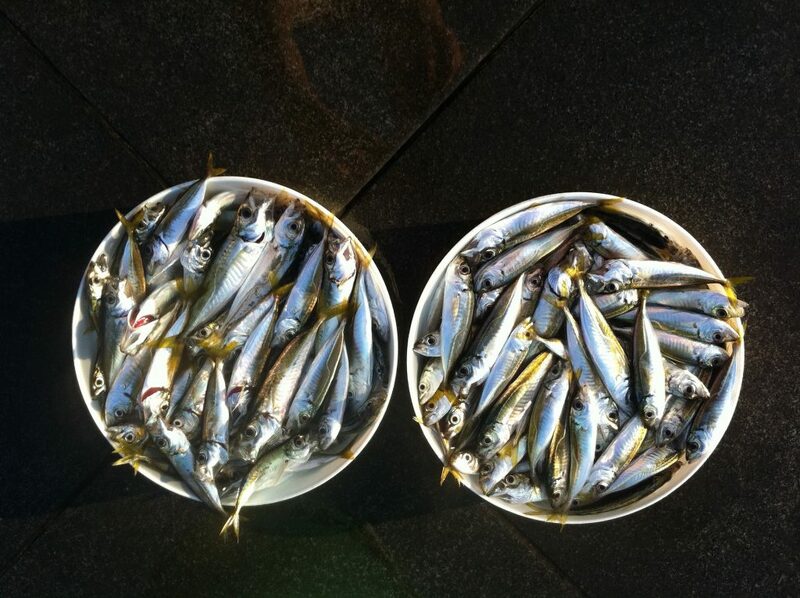 Similarly, sardines played a great and crucial role in the culture of the Portuguese. Portugal has always had a heavy reliance on sardine fishing as a central means for the nation’s commerce. In the streets of Spain, grilled sardines have the reputation of being a favorite snack for tourists, grilling sardines served with tapas are very popular with the Spanish. In Turkey, steamed sardines are a staple in Turkish cuisine, especially as a main dish served with the traditional Turkish liquor Raki. Finally, on a slightly less positive note, in the United States, since the last 50 years, sardine operations have been in constant decline. Sardines in the Philippines have a great reputation and strong value in the everyday market. It is a staple in local consumerism and a standard in widespread local meal planning. The Philippines is currently on the rise as one of the world’s major sardine suppliers. According to the DTI (Department of Trade and Industry), the Philippines is currently top supplier in the entire Southeast Asian region. Sardines in the Philippines, specifically in the Region 9 or Zamboanga Peninsula, produces for about 85 percent of the entire country’s sardine demands and has the capacity to supply the entirety of Asia. The current resurgence experienced by the country’s manufacturing industry directly entails to garnering greater international market access. The conjoined forces of both private and public organizations of Zamboanga and Region 9 in its entirety has warranted a tremendous support for local sardine industries as well as other native commodities. With an estimated yearly sum of about 7.43 billion pesos in circulation from the sardines in the market, it’s very much evident that the local sardine industry is one of the country’s most dynamic players in its economic circuitry. The entire processing scale for sardines has and is still currently employing many thousands of Filipino citizens as everything from fishers to factory workers, from canners to dryers, from bottlers to distributors or transporters. Conserving sardines in the Philippines is a matter of utmost serious consideration. The rapid advancement of high powered equipment and commercial gear is a definite double-edged sword. Although these massive scale fish-catching devices enhance productivity, they also can be a potential threat, possibly contributing to the local extinction of the species. The important thing to keep in mind is that a fitting balance always implemented with a strict adherence to Global Conservation regulations, such as that of Oceana. Sardines in the Philippines are indeed a vital symbol for life, despite the thriving boom of massive scale industry, local and provincial fishermen still catch fishing using the humbling tactics of spears and hooks. 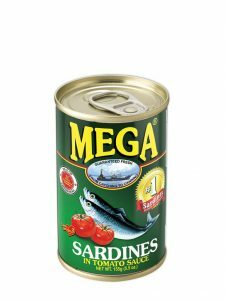 When it comes to the sardines of the Philippines, Mega Global is the forefront manufacturer and head distributor of canned goods. They are the minds behind one of the most innovative and top quality brand Mega Sardines. Mega Global only commits to the highest standards of professionalism and a passion for excellence that defines the brand. The Mega Global trademark is their 12-hour catching-to-canning process for fish including sardines in the Philippines from fishing to packaging that ensures the highest quality of freshness in each and every one of their fine products. Mega Global also showcases the utmost of excellence of their company in lieu with their products by sparking imaginations and taste buds with all the yummy possibilities when it comes to cooking with sardines – an endless playground of culinary excitement. Mega Global comes equipped with some fun recipes that are easy for you to try out yourself within your own home. The scrumptious delight of the Mega Sardines Bread Roll Surprise will surely get any dinner party going. The culinary splendor of the Mega Sardines Y Misua has the capacity to definitely be an afternoon time merienda classic for anybody suddenly hit with hunger at home. The definitely fulfilling and flavorful twists of the Mega Sardines Caldereta would make for an astounding main course on any Filipino dinner table. Want more? Visit their website now to learn more about these recipes, products, and services of Mega Global!